The Bulls scored five tries as they claimed a well-deserved 39-33 win over the Sharks at Loftus on Saturday evening. CRAIG LEWIS reports. Both teams deserve plenty of kudos for the quality of this clash. After the Stormers and Lions had lost to New Zealand opponents earlier in the day, this derby sent out a much-needed reminder of the skills possessed by South African sides. However, it was the Bulls who did make most of the running, while displaying the necessary class and composure in the key moments to claim an all-important victory in a contest that really had it all. The end result sees the Pretoria-based side move level on log points with both the Sharks and Jaguares in the South African conference, which is looking increasingly competitive despite the fact that the Lions remain eight points clear at the summit. The Sharks had seemed to have made an ideal start to this match when Curwin Bosch dived over for an apparent try in the 10th minute. However, the five-pointer was ruled out when the TMO correctly spotted that the Sharks fullback had tripped opposite number Warrick Gelant earlier in the movement. To add to the visitors’ woes, Bosch was sent to the sin bin for his cynical infringement, and almost immediately after, Gelant piled on the punishment when he went over for a try after snapping up a beautifully-weighted grubber from Jesse Kriel. 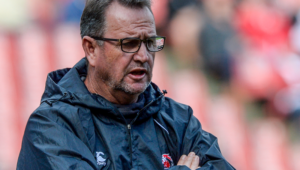 Moments later, Kriel went from creator to try-scorer when he broke through an outnumbered defence to stretch the Bulls’ lead as Bosch was left to further lament his unnecessary act of foul play. The drama continued unabated as Bosch returned to play, and was put away for a try with virtually his first touch after coming back into action. However, the Bulls hit straight back as Roelof Smit scored an opportunistic try to cap off a quite remarkable opening half-an-hour of proceedings. The upshot was a 19-7 lead to the Bulls after a breathless start to this drama-filled contest, which was only exasperated when RG Snyman was then sent to the sin bin for a late shoulder charge on Cameron Wright. Within a minute of the Bulls lock leaving the field, the Sharks scored through Jacques Vermeulen. Before the break, Handré Pollard and Bosch traded a penalty each as just five points separated the sides as they headed into a welcome half-time interval after a quite enthralling opening stanza. Although the Sharks had been guilty of giving away possession far too easily in the first half, they did a better job of hanging on to the ball after the restart and cashed in on two kickable penalties to move into the lead for the first time at the 50-minute mark. 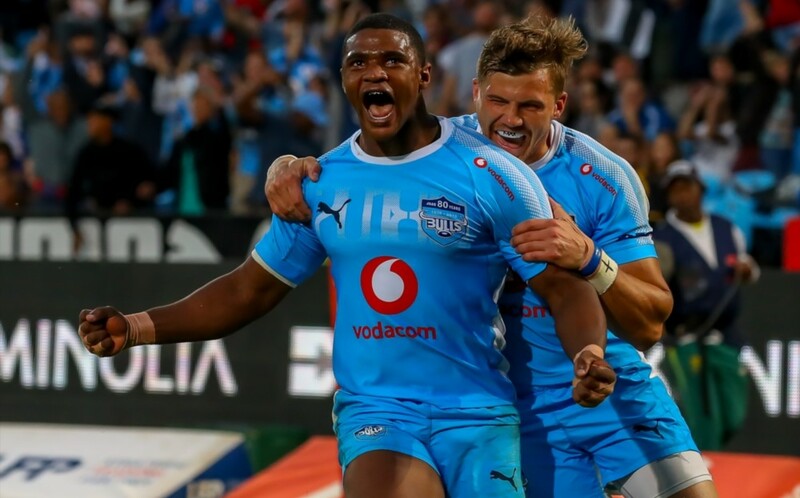 Yet, just as it seemed that momentum was beginning to swing in favour of the Sharks, the Bulls regained the lead when Johnny Kotze scored an opportunistic try, before Lood de Jager dotted down in the 65th minute to send the hosts into a commanding 36-23 lead. The result was effectively sealed when Lukhanyo Am was shown a yellow card soon after for taking a player out in the air, with Pollard further extending the Bulls’ lead from the resultant penalty. Jean-Luc du Preez would score a consolation try for the Sharks, while a late penalty handed the visitors a losing bonus point, but it was the Bulls who were left to celebrate after doing the double over their coastal foes this season. Bulls – Tries: Warrick Gelant, Jesse Kriel, Roelof Smit, Johnny Kotze, Lood de Jager. Conversions: Handré Pollard (4). Penalties: Pollard (2). Sharks – Tries: Curwin Bosch, Jacques Vermeulen, Jean-Luc du Preez. Conversions: Rob du Preez (3). Penalties: Bosch, Du Preez (3). Bulls – 15 Warrick Gelant, 14 Travis Ismaiel, 13 Jesse Kriel, 12 Burger Odendaal (c), 11 Johnny Kotze, 10 Handré Pollard, 9 Ivan van Zyl, 8 Marco van Staden, 7 Jason Jenkins, 6 Roelof Smit, 5 Lood de Jager, 4 RG Snyman, 3 Trevor Nyakane, 2 Adriaan Strauss, 1 Lizo Gqoboka.